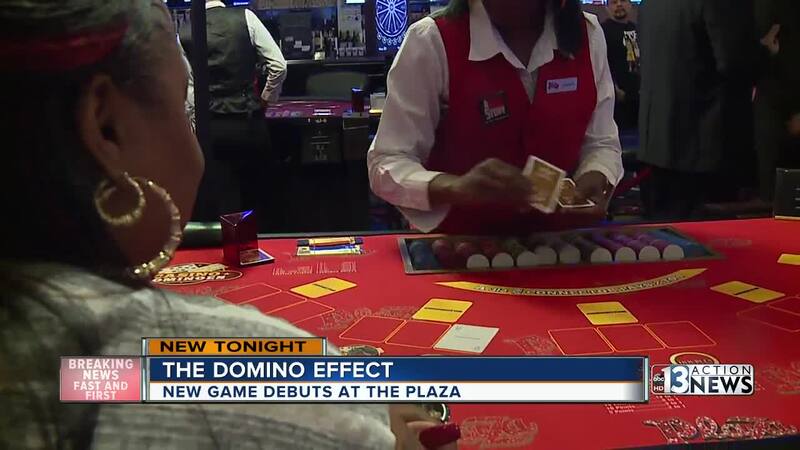 A recent UNLV graduate celebrated in a suit accented with domino pins as the first people put chips down to play Casino Dominoes at the Plaza Hotel & Casino. Harold Moret says he visited 150 casinos before getting the Plaza to agree to test his game on their casino floor. "Finally, dominoes in a casino," Moret said. The Los Angeles native designed the playing card version of dominoes while a student in UNLV's Center for Gaming Innovation. "It is the same game. If you know how to play dominoes, you know how to play the table game," Moret said of the basic gameplay. Just like the tile version of the game, Casino Dominoes is based on creating multiples of fives. Players are dealt 3 domino cards face up, plus a connector card in hopes of creating matching sequences with payouts as high as 500 to 1. "The more points the more money. The more doubles the more money," Moret said. The UNLV alumnus says he owes a lot to the Center for Gaming innovation which he entered after pushing dominos forward as the creator of the Universal Domino League. "I always said to myself why wasn't there a game on the floor representing dominoes," Moret said. "UNLV changed my life. It gave me a newfound purpose." Part of that change came with the help of the program's Associate Director Dan Sahl. "We gave Harold our expertise and he gave us his knowledge of dominoes and his creative idea for this game," Sahl said. "We took what was good and we simplified." With Casino Dominoes being played at the Plaza Hotel and Casino, both Sahl and Moret are hopeful the best is yet to come. "I think this is going to be the first of many," Moret said. Moret is in good company, as the program has launched at least four other table games that have seen time on Las Vegas casino floors.